The Jousting Life: Jeffrey Hedgecock Wins the "Tournois de la Lance D'Argent 2013"
Jeffrey Hedgecock Wins the "Tournois de la Lance D'Argent 2013"
Jeffrey Hedgecock was the winner of the "Tournois de la Lance D'Argent" in Neauphle-le-Chateau near Paris, France this weekend. Riding the Arab mare 'Sybelle', Jeff triumphed over the 13 other competitors in the tournament. In addition to running his own passes, Jeff rode for Canadian competitor Marc Hamel, was forced to retire from the competition due to injuries sustained at the Tournament of King John III in Poland the previous weekend. As the winner of the tournament Jeff was awarded a new, rotating trophy created this year for the tournament. 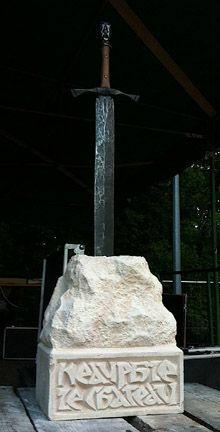 The sword and carved stone base were made on site by craftsmen over the weekend. It is a rotating trophy which will stay on display in France, to be won by someone new each year. Jeffrey is the first winner. The jousting trophy depicting a silver lance was forged by the blacksmith at Castle Gniew in Poland. This trophy will return with Jeff to his home in California as a memento and reminder of a memorable European tour with great friends. Jeffrey Hedgecock is a member of the Order of the Crescent. He is the master armourer at Historic Arms and Armour, and the principal instructor at WorldJoust Tournaments' Knight School.